“Species Scape” by Francis Fawcett. A digital version of the original design drawn by Francis Fawcett and prepared by Quentin Wheeler. We humans are far outnumbered by organisms that are much smaller and “less complex” than ourselves. 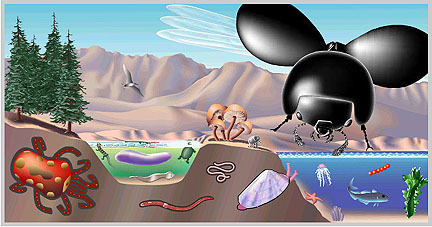 The cartoon above depicts representatives of major groups of organisms, and each organism is drawn such that its size reflects the number of species contained within its group. The bird, the fish, and the trees look as expected, but you may notice the enormous beetle. No, beetles are not generally larger than trees or elephants, but there are more species of beetles than any other group of organisms. Beetles are a wonderful representative of the biodiversity of the earth because they can be found in almost every terrestrial and non-marine aquatic environment! Examples of carabid beetles of the tribe Clivinini (top row; photos with ‘HG’ – Henri Goulet, otherwise – David Maddison). Male genitalia of a clivinine species, Ardistomis obliquata, with possible ‘copulatory weapons’ (right) and several examples of clivinine female genitalia (bottom row) modified from Zookeys 2012;(210):19-67 shared under CC BY 3.0. Our guest this week, Antonio Gomez from the Department of Integrative Biology, studies a group of beetles called clivinines (pronounced kliv-i-nīnz) which has 1,200 species, and potentially more that have yet to be discovered. Antonio is also particularly interested in the morphological diversity and evolution of clivinine beetle sperm. Antonio wants to know: What is the evolutionary history of clivinine beetles? What is the pattern of morphological diversity of sperm in clivinine beetles, and how are sperm traits evolving? The objective is to collect beetles, study their form, sequence their DNA, and understand their diversification. Several examples of sperm conjugates (cases where two or more sperm are physically joined and travel together) in carabid beetles. Conjugation is considered rare, but in carabid beetles, it’s the rule and not the exception to it. In many carabids, sperm leave the testis but do not individualize. Instead, they remain together and swim as a team. This is no small task, but Antonio is well equipped with microscopes to dissect and describe beetle anatomy, a brain geared to pattern recognition, and some fresh tools for genome sequencing. All of this is used to build an evolutionary tree for beetles. This is kind of like a family tree, but with species instead of siblings or cousins. Antonio and other students in the lab of David Maddison are adding knowledge to the vastness of the beetle unknown, bit by bit, antenna by antenna, gene by gene. Antonio Gomez collecting beetles near a really bright light (a mercury vapor light trap) near Patagonia, Arizona. Like many of our graduate students at Oregon State, a group of great mentors can make all the difference. Before working with Dr. Kelly Miller at University of New Mexico, he never knew beetle phylogenetics meant exploring exotic locations around the world to collect and potentially discover new species. As an undergraduate, Antonio even named a species of water beetle, Prionohydrus marc, after the undergraduate research program that go him started as a beetle systematist, the Minority Access to Research Careers (MARC) program. Pretty amazing. 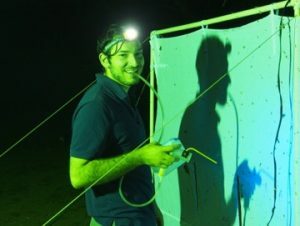 That was not his first or last research project with insects before he joined ranks at Oregon State, he also was participated in a Research Experience for Undergraduate program at the California Academy of Sciences and completed a Master’s at University of Arizona. Now he has ample experience working with beetles and is maybe a little overwhelmed but still excited by the unknown beetle tree of life. Next on his list of questions: did the ancestor of all clivinines likely have sperm conjugation? You’ll have to tune in on Sunday April, 16 at 7 pm to hear more about that evolutionary arms race! Not in Corvallis? No sweat! Stream the show live. Can’t get enough? Follow this link to learn about Stygoprous oregonensis, a blind subterranean diving beetle that had not been seen in 30 years. Recently, a team of researchers that included Antonio Gomez reported the discovery of more specimens, which allowed them to place Stygoporus in an evolutionary tree. 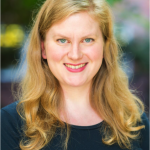 This entry was posted in Integrative Biology and tagged beetles, biodiversity, biology, carabids, clivinines, evolution, species, systematics on 2017-04-12 by Kristen Finch. People often think of science as focusing on very specific questions or rigorous hypothesis testing. However, some of the most exciting advancements were the result of general curiosity of seemingly disparate ideas, and a sprinkle of creativity. For example, the beginnings of how electricity was discovered started by poking frog legs with different types of metals. The modern zero-calorie sugar (saccharin) was discovered by playing creative-chef with coal tar products in the 1870’s when the chemist accidentally tasted his chemical concoction. Our guest this week is using young zebrafish to investigate how environmental factors affect their behavior, and whether behavioral changes can be attributed to specific brain activity. Why zebrafish you may ask? 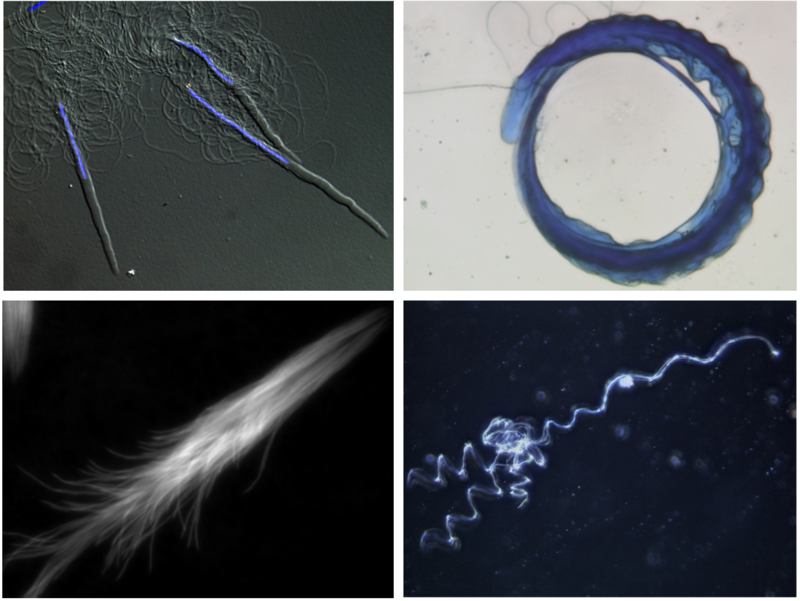 They are a model organisms or they tend to be well studied, relatively easy to breed and maintain in lab settings, and as vertebrates, they share some characteristics with humans. 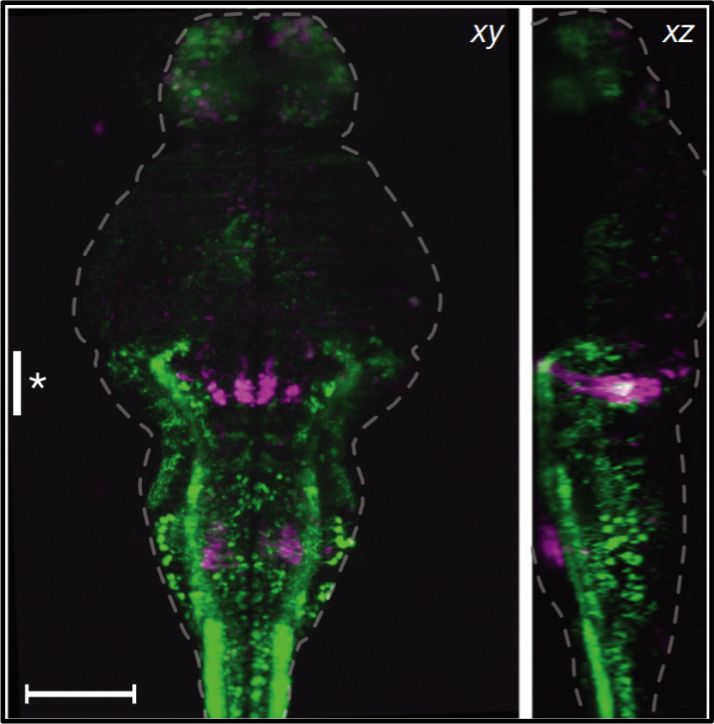 The more we know about zebrafish, the more clues we may have into our own neurobiology. Sarah Alto is exposing these model organisms to different levels of oxygen and carbon dioxide stress. She monitors their swimming with infrared cameras and examines their brain to get an idea of how they respond to stress physically and mentally. This is no easy task because the young zebrafish are only a few millimeters long! 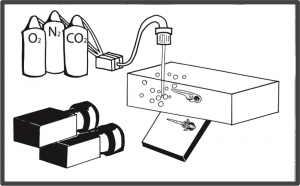 Oxygen, nitrogen, and carbon dioxide gas is bubbled into the tank holding the larvae. The entire set-up is enclosed in a light-tight box so the larval behavior is more connected to the environment changes and not human interaction. Curious Sarah is asking: Are low oxygen or high carbon dioxide concentrations changing the swimming behavior of zebrafish? 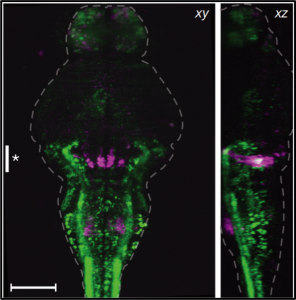 What happens in the brain of a zebrafish when it experiences environmental stress? What can we learn about how environmental factors shape the brain’s connections and influence behavior? 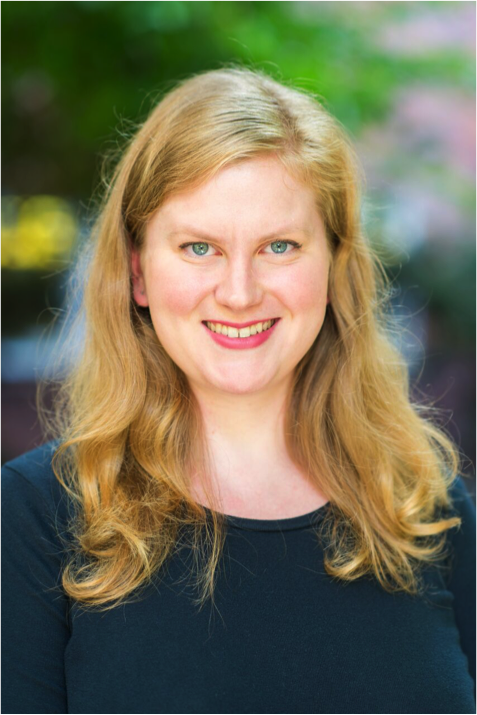 Sarah has a long road ahead of her, one that is unpaved with many junctions, but she is performing the exploratory work that may inspire future investigations into the affects of stress on the brain. The second part of Sarah’s research will be investigating the neural activity when the larvae are exposed to the same gas concentrations as studied in the behavioral experiments. Prior to Sara’s interest in biology, she was always drawn to art as an escape and a method of expression. When choosing which colleges to attend, she didn’t want to choose between art and science. So she chose to pursue both! Sarah enrolled at UC Berkeley as double major including Molecular and Cellular Biology, as well as Practice of Art. The San Francisco art scene was highly accessible, and Berkeley is a top-flight university for the sciences. Needless to say she flourished in this environment and her love of science grew but her love of art continues to this day. Finishing her schooling she began working at UC San Francisco, a premier medical research university, investigating the role of stem cells in facial development to for possible medical treatments for facial reconstruction. She was involved in a variety of projects but her gut feeling led her to continue schooling at Oregon State. Sarah is now a part of Dr. James Strother’s lab in the College of Science within the department of Integrative Biology focusing the behavioral neurobiology of zebrafish. Be sure to tune in Sunday April 9th at 7PM PST on 88.7FM or listen live. This entry was posted in College of Science and tagged biology, genetics, neurobiology, zebrafish on 2017-04-08 by Adrian Gallo.